I (Brian Vike) had been wandering around the town of Houston, British Columbia when I met a person who stopped me and asked if I had heard from a man who lives in Kelowna, British Columbia over a UFO sighting he had. The lady ended up giving me the name and number of the guy who wanted to contact me. His name is Harry who at one time used to live in Houston, British Columbia where I reside, and he was eager to tell his story of what went on around the Savona, British Columbia area. He related an amazing story to me over what he experienced. Harry had a large UFO incident which took place on August 31, 2008 at approximately 1:30 a.m. when he was on a week's holiday. The man was driving his pickup truck and pulling a trailer. All was fine on his journey as he traveled down Highway 97 heading south from Lac La Hache. He came to a main junction at Cache Creek where the highway can take you to Vancouver, British Columbiafollowing highway 97 south, or you can head east on the Trans-Canada Highway 1. The shortest route for him was the highway 1 which headed towards Kamloops, British Columbia and other communities along the way. I should point out that this entire region of British Columbia is a hot, dry area. The climate around Savona is a semi-arid steppe climate due to its rainshadow location. 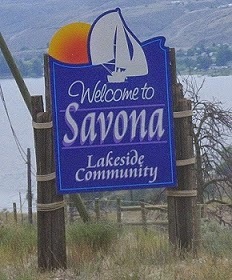 While situated in a semi-arid valley, Savona has winters that are generally mild and very short with an occasional cold snap where temperatures can drop to around -30 °C (-22 °F) when arctic air floods over the Rocky Mountains into the interior. Harry reached Savona, still heading east and on the left/north side of the highway there is a fairly large company with all different types of used mining equipment scattered throughout their property. Just down the road a way, he came to a little store off to the side of the highway. All of a sudden to his right/south and coming from over top of the mountain was a very bright light. At first he thought maybe it might be people driving a 4x4 vehicle, but he quickly thought about it and he knew at that point there were no dirt roads on the side of the mountain. As the light drew closer to him he was able to see clearly that this wasn't just one light, but three. Two lights positioned at the top and a single light at the bottom. Basically the lights took on the shape of a triangle. Eventually the three lights swooped down towards him and crossed over top the Trans-Canada Highway 1 and Harry's truck, placing the object on the north side of the highway and flying at tree top level. The craft made a turn and was now heading in the same direction as Harry was traveling, which would be east towards Kamloops, British Columbia. Harry tried to keep an eye on the object, but at the same time watching where he was driving. The craft seemed to be pacing the truck then rose up slightly and then again swooped downward and Harry finally lost sight of it. He said it surprised him that the object vanished as he was sure it would appear again. Harry tried to rationalize what he had seen. Maybe an aircraft with pontoons landing on the lake, etc. But nothing seemed to click into place for him because it was a very unusual sight. Excitement over with, Harry continued driving. He went up a steep part of a hill which had a few sharp curves, he gets to the top and starts his descent down the hill and ahead of him on the highway, coming in his direction are the same lights he just finished observing minutes ago. He thought to himself, this has to be a truck or some type of vehicle and they should meet up very quickly. To his surprise the lights vanished once again. There was no turn off that he was aware of, so as he sat in his vehicle he wondered what the heck was going on. Not too far down the highway he spots what appears to be blue and white flashing lights and he thought that maybe there was a police road block or an accident. He slows the truck down preparing to come to a stop if need be, but what he thought was an emergency vehicle on the road wasn't the case. About 500 to 600 feet off to the left hand side of the highway was a strobing light. Harry said the flashing was intense, approximately every half second there was another flash. It was so fast and so very bright. Also it was stationary just off of the ground. All of a sudden the object jumped (as Harry put it), in other words, from a stationary position it appeared to rise up and drop down again. If you can, picture children playing leap frog is the best term that I can think of to use to illustrate the UFOs movements. He said the object went from a stop, then made about a 20 foot jump into the air in a split second, it jumped again and this time it made an estimated jump of approximately 50 to 60 feet and then it kept jumping at greater distances. He figured the UFO was now moving around 500 feet at a time. The object made numerous jumps and Harry wasn't sure if he was able to hear any sound or not. He thought the UFO gave off a swooshing sound, but again he couldn't be completely sure of this. This thing traveled along at an incredible speed. It made a final jump which had it heading straight towards Harry's truck. Pretty much freaking out at this point, Harry said the UFO, with one of the last jumps, landed maybe 100 feet behind the trailer he was pulling. This would have had the UFO hitting the asphalt/road behind him. After this he wasn't able to see the UFO anymore. He said he hit the gas pedal and was out of there. He told me that he had no plans of stopping to check this out and wanted to get out of there as fast as possible. That was it for his night's scary encounter with an Unidentified Flying Object.